Volunteer Behavioral Health Care System | Help today… for a better tomorrow. Serving over 55,000 people in 31 counties, Volunteer Behavioral Health Care System is a leading mental health provider in the middle, southeast, and upper cumberland regions of Tennessee. We strive to make a difference in every life. We live by our slogan, "Help Today... For a Better Tomorrow". Volunteer Behavioral Health Care System welcomes any person seeking services for mental health conditions or addiction issues. We use a “no wrong door” approach, and serve people with co-occurring mental illness and addiction based on our core values. Quick reminder.. our locations will be closed tomorrow. 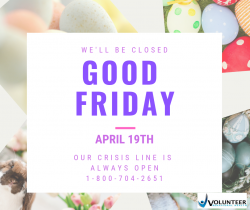 Our Crisis line and staff are always available. If you or a loved one is in crisis: call our Crisis Team at 1-800-704-2651. ▶ I have seen Case Management listed as a service at several mental health centers. What is Case Management and who does it help? Case Management is a specialty service to assist individuals and families cope with serious mental illness. For many people, Case Management is a lifeline between resources in the community, medical care and mental health care. At VBHCS, our Case Managers are in the community every day helping people coordinate appointments, access resources such as food banks or transportation and providing emotional support to individuals and families. Case Management is a very special helping profession, one in which Case Managers become close allies and advocates of individuals and families who work daily to cope with the effects of mental illness. Our Case Managers visit with individuals in their homes, or other community-based locations. They bring with them educational materials, information about community resources and most importantly a caring attitude and commitment to the individuals and families being served. For more information about how you may benefit from Case Management, please contact any of the VBHCS locations convenient to you. Contact us for more information about the available treatment options.